The Wavertree. 1885. Constructed at Southhampton for R. W. Leyland & Co. of Liverpool. Extreme length: 325; length on deck: 263; beam: 49,2'. South Street Seaport Museum, New York, New York. She was first employed to carry jute, using in making rope and birlap bags, between eastern India (now Bangladesh) and Scotland. . . . By the time Wavertree was built, she was nearly obsolete. Steam engines suitable for effiiently propelling ships acrioss th eocean had been introduced in the 170s, and were being used on nearkly sall the shorter trade routes. While this was taking place, iron — long the choice of ship builders in iron-producing countries, such as England — was giving way to steel. 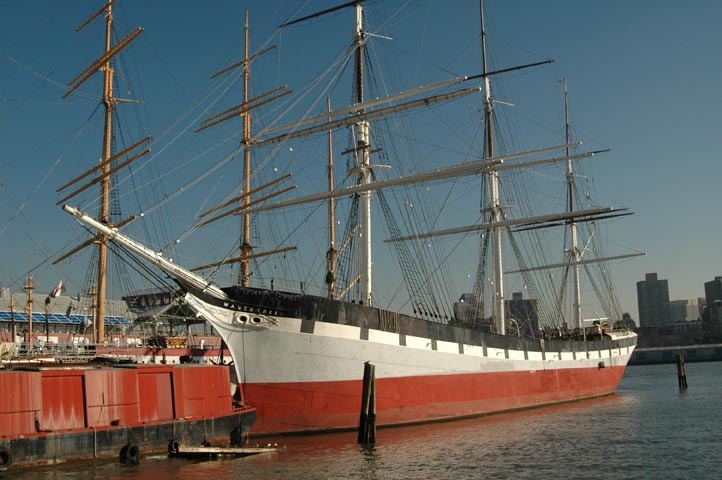 Wavertree was one of the last large sailing ships built of wrought iron. Today she is the largest afloat. Most countries stoped building large sailing ships in the first decade of the twentiieth century. The last large cargo-carrying sailing ship was launched in Germany in 1826, The last two to round Cape Horn with cargo did so in 1949, carrying grain from Australia to Europe. The masts appearing behind the Wavertree belong to the even larger black-hulled four-masted bark Peking (1911) built in Germany a quarter century after the Wavertree.